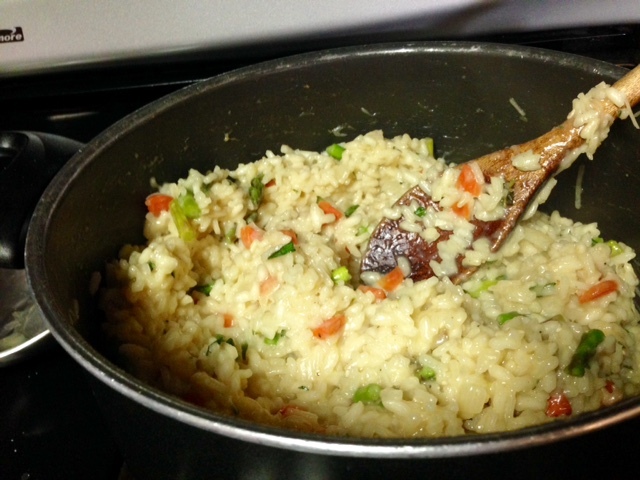 It’s kind of weird that I’ve never made a risotto primavera, given my love of risotto. But when I was home for Passover this year, we were trying to come up with a delicious side dish and my mom mentioned risotto. 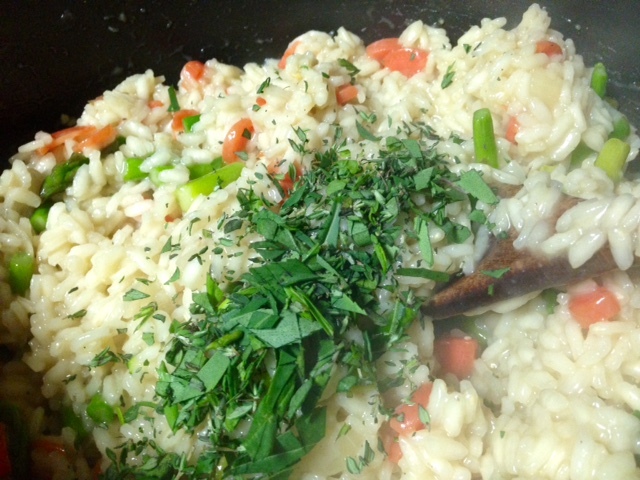 We thought about all the veggies we had, and all the fresh herbs, and I decided that it was the perfect idea. 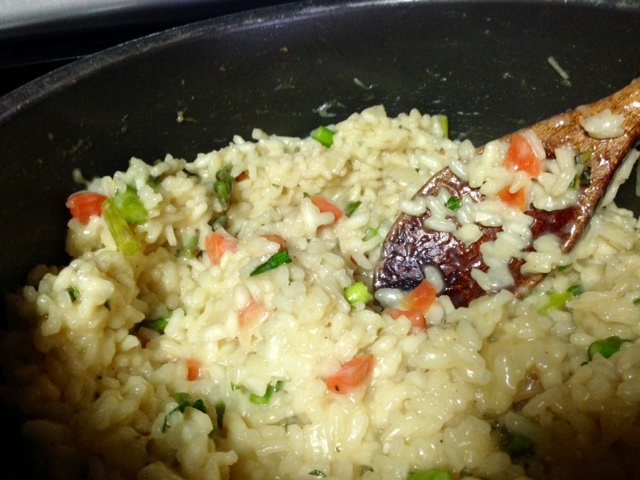 I’ve said this a million times, but people always think risotto is so difficult. But it’s not! 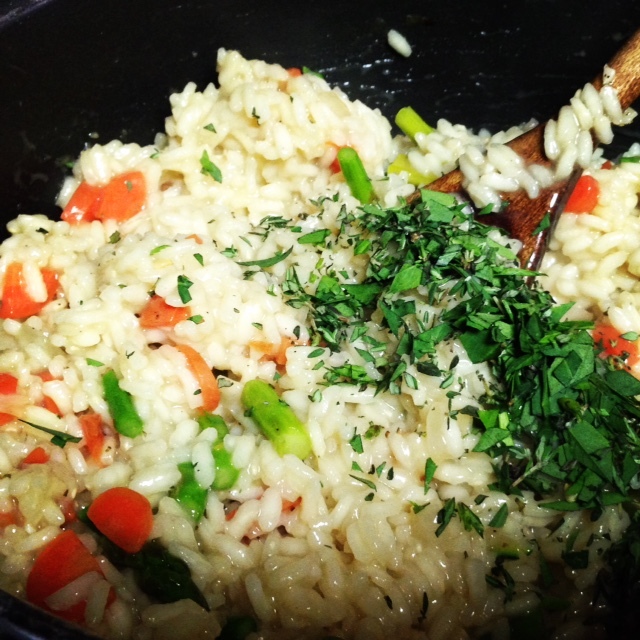 It just needs a little TLC…you can’t rush it, but 90% of risotto is in gently stirring. You get too rough with it, try to turn the heat way up to rush it, and that’s when things go south. Plan for an hour. But it’s an hour of stirring, drinking wine, talking to guests—it’s the perfect dinner party dish. 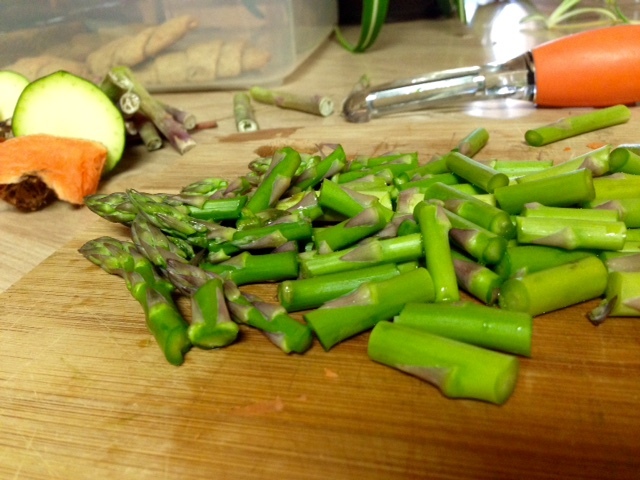 Prep your spring veggies…we had asparagus and carrot on hand for the additions. Spring peas would be amazing, and zucchini or squash would be great as well. 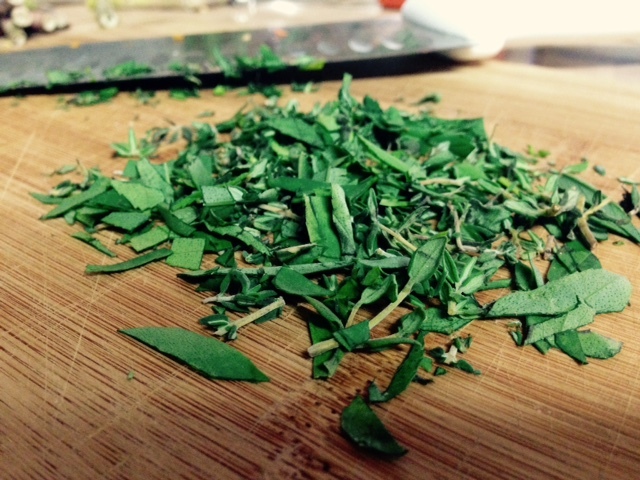 Go ahead and mince up your fresh herbs and set aside. Dice the onions, which will go in your risotto starter. 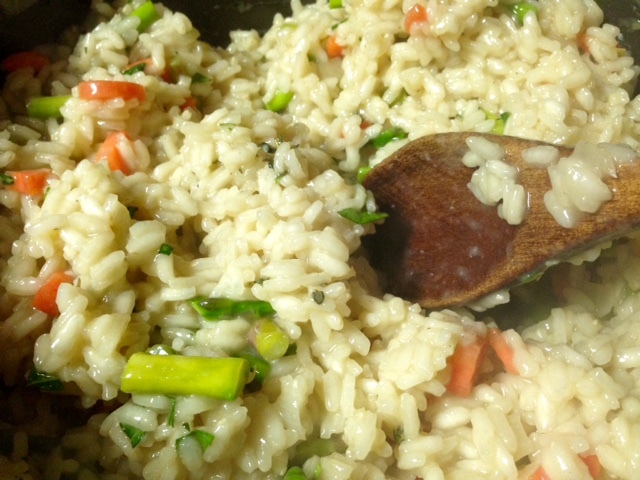 You can go ahead and flash-saute your veggies ahead of time, or do it while you’re stirring your risotto. Just saute with about a tablespoon of olive oil for 3-5 minutes, just to get them to soften a little bit but retain their crunch. In a small saucepan over medium heat, combine the chicken broth and water and bring to a simmer (not a boil). Keep on low while the risotto cooks. Set a Dutch oven or large saucepan over medium heat and add 2 tablespoons of the butter to it. 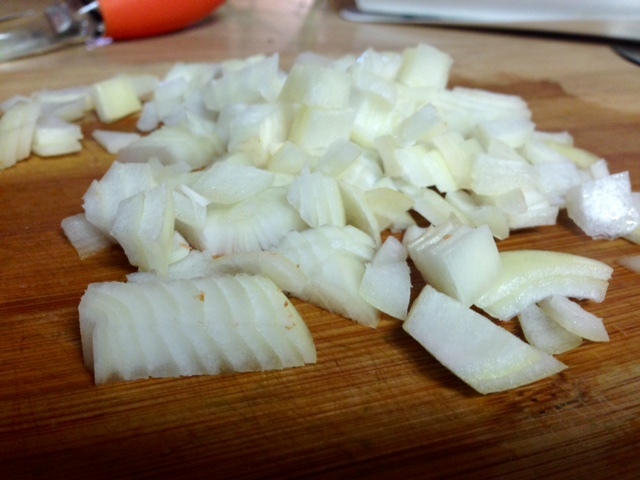 Once it’s melted, add the garlic and diced onion, and cook just until fragrant, for about a minute. Then add the rice to the pan, stirring to coat it with the butter, then keep cooking for about 3 minutes, stirring frequently. The grains will start to get translucent around the edges. The most fun part…pour the wine in so it gets all sizzly and steamy. Cook, stirring constantly, until it’s fully absorbed (a couple minutes). 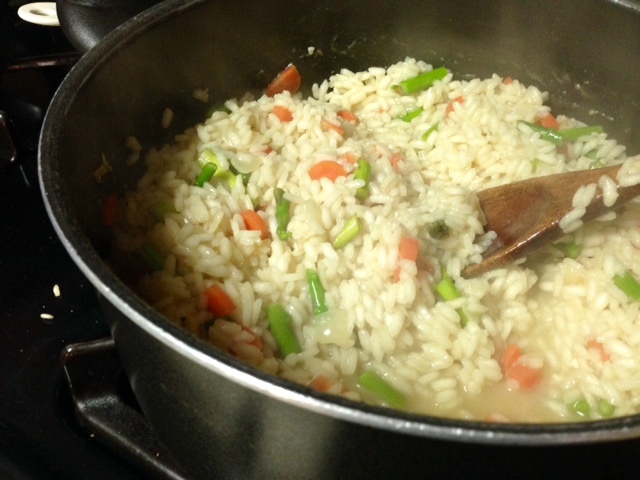 Reduce the heat to medium-low and stir a ladleful of the hot broth into the rice. 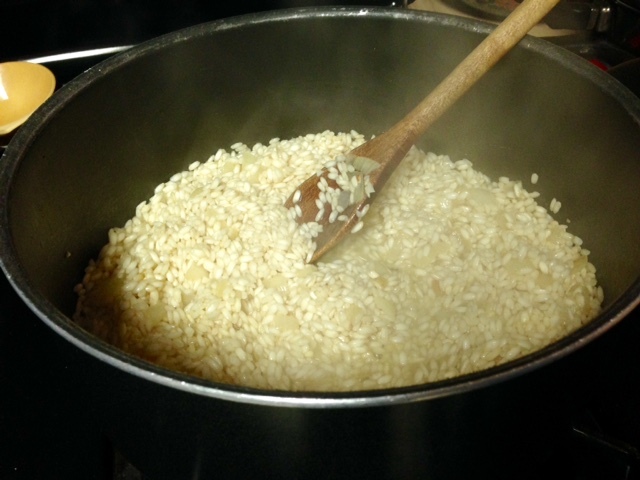 Continue stirring the rice gently but constantly until it has been absorbed, then continue this process—add a ladleful of broth, stir until it’s fully absorbed, and repeat until the stock is gone. Have a glass of wine. Chat with your guests. Have another glass of wine. When you stir in the last small ladleful, don’t let it absorb all the way (or it can get glue-y). Stir consistently—not every second and not too roughly, but do keep stirring pretty much the entire time. This whole process should take about 30 minutes. 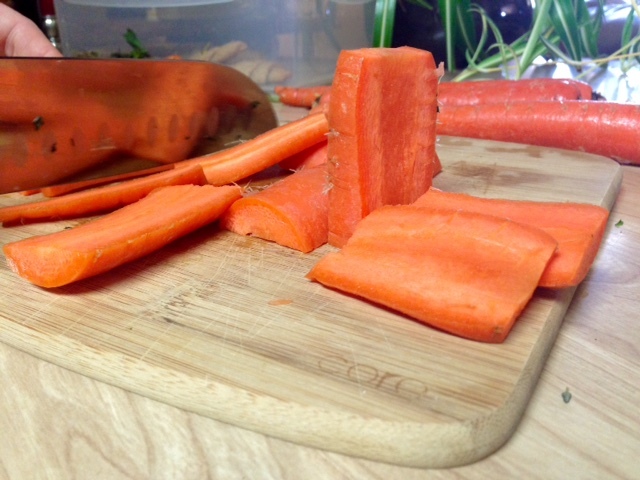 When you add the last ladle of stock, add your crisp but sauteed veggies as well. Stir for another minute. 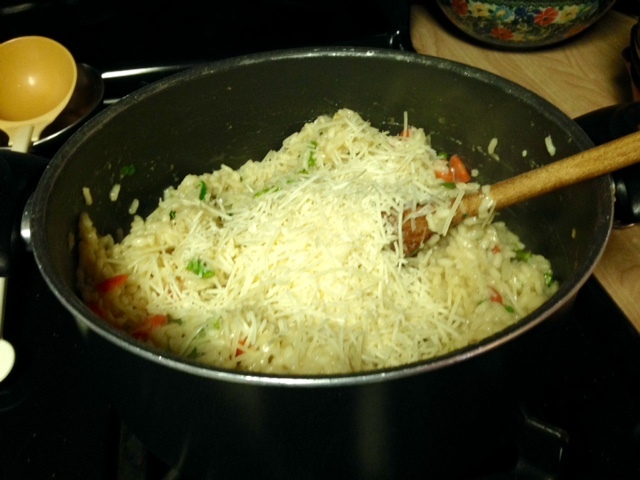 Then add the minced herbs and half of your parmesan cheese. Cook for another minute or two, then remove from the heat and add the rest of the parmesan and the rest of the butter. Stir until just combined, then leave it alone. Serve right away, and feel free to garnish with some extra herbs and parmesan. 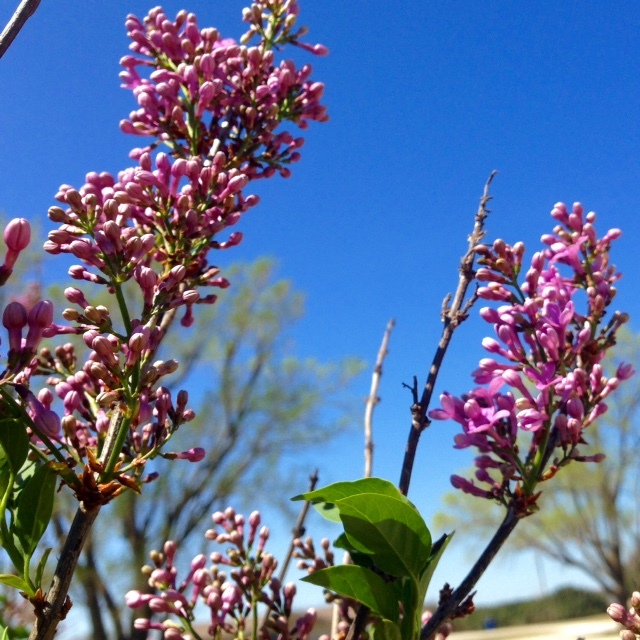 Enjoy the springtime explosion happening in your mouth. In a small saucepan over medium heat, combine the chicken broth and water and bring to a simmer (not a boil). You can go ahead and flash-saute your veggies as well—just saute with about a tablespoon of olive oil for 3-5 minutes, just to get them to soften a little bit but retain their crunch. Add 2 tablespoons of the butter to a Dutch oven or large saucepan set over medium heat. Once melted, add the garlic and diced onion, and cook just until fragrant, about a minute. 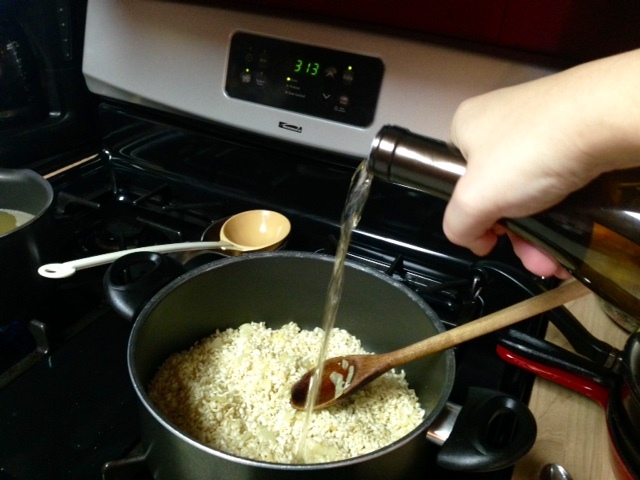 Add the rice to the pan, stirring to coat. 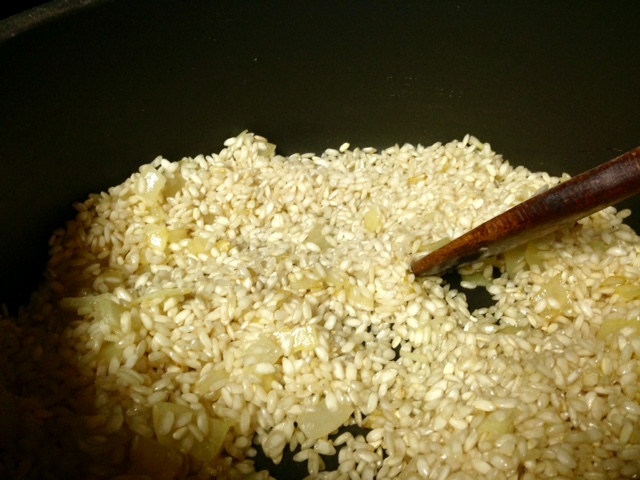 Cook, stirring frequently for about 3 minutes, until the grains are translucent around the edges. Pour the wine in and cook, stirring constantly, until fully absorbed (a couple minutes). 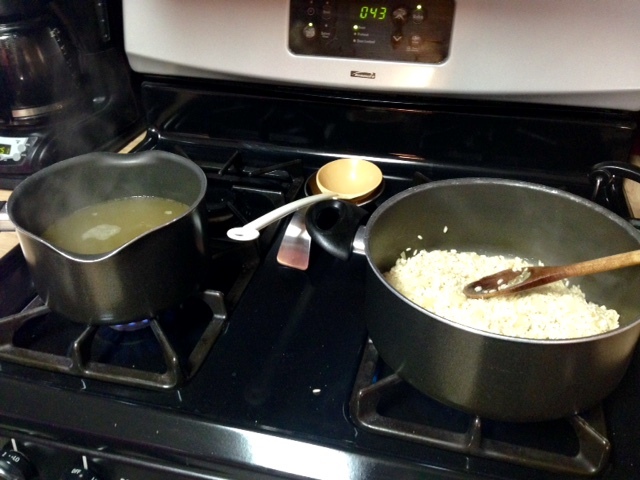 Reduce the heat to medium-low and stir a ladleful of the hot broth into the rice. 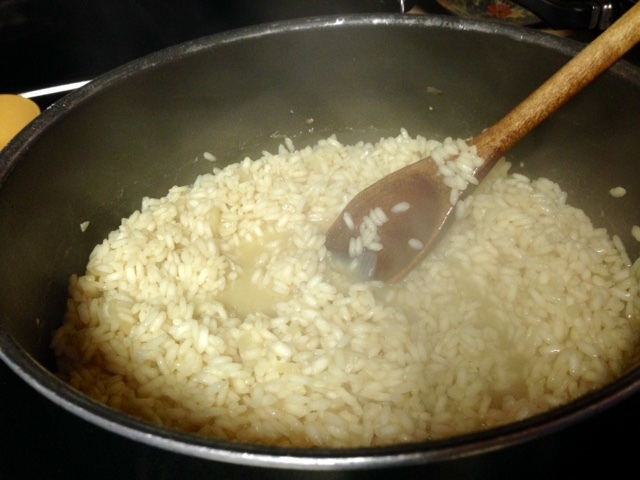 Continue stirring the rice gently but constantly until it has been absorbed, then continue this process—add a ladleful of broth, stir until it’s fully absorbed, and repeat until the stock is gone. When you stir in the last small ladleful, don’t let it absorb all the way (or it can get glue-y). Stir consistently—not every second and not too roughly, but do keep stirring pretty much the entire time. This whole process should take about 30 minutes. When you add the last ladle of broth in, add the crisp but sauteed veggies as well. Stir for a minute, then remove from heat and stir in most of the parmesan and the fresh herbs, as well as the remaining 2 tablespoons of butter. 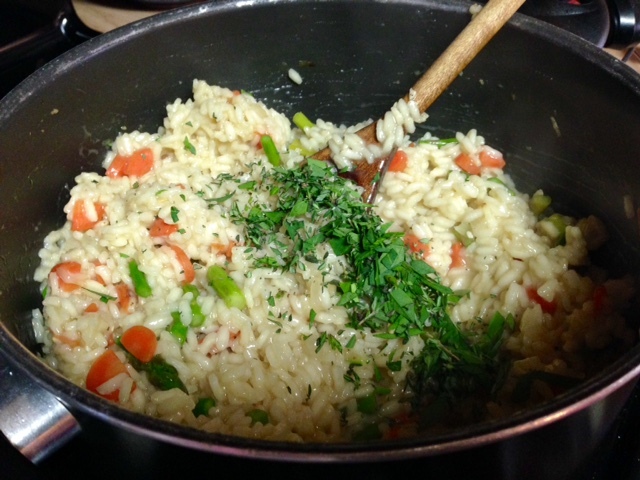 Season with salt and pepper to taste, and garnish with the remaining parmesan and some more herbs if you’d like. Serve immediately.